Moses Coady was born in the Margaree Valley, Cape Breton, Nova Scotia, on January 3, 1882, a double first cousin and protégé of Rev. Jimmy Tompkins. He described his early education as “somewhat spotty” and sporadic due to farm chores and a crowded home, but his curiosity blossomed in later youth. He was noted to have said that at the age of twelve he was doing the work of a man. Determination and a strong work ethic formed the core of his personality at a young age. From 1900-1901 he attended the provincial normal college in Truro and acted as principal of the Margaree Forks High School from 1901-1903. In late 1903, Coady registered at St. Francis Xavier University [St.F.X.] in Antigonish, Nova Scotia and excelled in its Bachelor of Arts program. In 1905, he graduated and answered the call to the priesthood. Bishop John Cameron chose him, as well as Hugh John MacDonald, to study at Rome’s prestigious Urban College of the Propaganda Fide. Here he completed both a Doctorate in Divinity (D.D.) and a Doctorate in Philosophy (Ph.D.) and was ordained priest in 1910. Upon his return, Coady was appointed to St.F.X where he taught in the high school and the university. 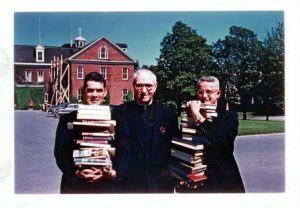 In 1914, Bishop James Morrison sent him to the Catholic University of America in Washington, D.C. for graduate studies in education. A year later he returned with an M.A. and took up new duties as principal of the St.F.X. High School (1916-1925) and professor of education (1916-1928). Coady’s first foray into activities outside of the university happened in 1921 with the Provincial Educational Association [PEA]. Until then, it had been unable to significantly improve the pay and working conditions of teachers. In Truro, Coady suggested the Association strike an organizing committee, hire a paid organizer, and start a magazine for teachers. Members agreed and appointed him to the task; by early 1923, one-half of Nova Scotia teachers were paid members of the union. He started the teachers bulletin, and as editor, lobbied hard for higher teachers’ salaries and other benefits. When Coady resigned from the union in 1924, regional economic conditions were difficult for many people. There was labour unrest in the Cape Breton coal mines and continuing out-migration caused by economic decline. These factors profoundly affected the Diocese of Antigonish whose socially minded priests were searching for ways to counteract these problems. That same year, Coady had an idea for an artistic or folk school in Margaree. He later considered the scheme as the origins of the Antigonish Movement’s adult education model. The project helped Coady put into practice his theory that “the short, quick, scientific way to progress in the world, even in the field of formal education of youth, was through the enlightenment and education of adults.” He posed two questions: “What should people do to get life in this community and what should they think about and study to enable them to get it?” The basic technique of the Antigonish Movement–the formation of study clubs acting as crucibles in which co-operative group action was created through a persistent process of questioning, debate, education and learning–had emerged. During the late 1920s, several influences combined to bring the St.F.X. Extension Department into being. The diocesan conferences for clergy held on its campus called for St.F.X. to immediately get involved in solving the “rural problem”, and the Scottish Catholic Society, of Canada, the St.F.X. Alumni Association and local priests lobbied for extension work. In Canso, the plight of the inshore fishermen and the ensuing media coverage forced politicians to act. In late 1927, the MacLean Commission was struck to investigate problems in the fishery and to make recommendations. Coady testified at the Commission’s Halifax hearing in November 1927 and was later appointed to organize the fishermen. Meanwhile, on November 27, 1928, the St.F.X. Board of Governors finally decided to create an extension department and Coady was named its first director. Bishop James Morrison wanted to be assured that St.F.X. controlled and led the Movement. Coady’s appointment to organize Maritime fishermen into an association to maximize their buying power and set up cooperatives allowed him to put ideas into practice. He organized for 10 months and then convened the United Maritime Fishermen’s [UMF] inaugural convention in Halifax on June 25 and 26, 1930. His fisheries project helped to lay the foundation for the Extension Department’s future success. From 1930, Coady and his Extension colleagues developed a variety of techniques to initiate local community action. Wherever they operated, the Extension Department staff used existing parish networks to call mass meetings where the idea of the study club was introduced. Coady often spoke at those meetings and frequently lectured the community about its failings; he then challenged them to ask key questions: What do we need and how can we get it? Study clubs leading to co-operative economic action was the answer. First and foremost Coady was always the teacher. He was an outstanding orator as well as a prodigious letter, article and speech writer who expressed his views in an earthy, animated, and logical manner. During the early 1930s as the global depression worsened, the local community cooperative organizations created by the St.F.X. Extension Department staff in Antigonish gained momentum. Between 1932 and 1935, study clubs increased in number from 179 to 650, membership from 1,500 to 10,650, and credit unions from 8 to 45. From 1935 to 1939, the Movement continued to grow in both influence and reputation. In 1939, he published his only book entitled Masters of Their Own Destiny that gave an excellent account of his pragmatic vision of adult education and the work of the Extension Department in executing it. At the same time, World War II caused problems for the Extension Department as it diverted precious manpower and financial resources. The Extension staff was always over-taxed, forcing them to rely on short courses over fieldwork. The 1950s was a personally trying time for Coady. 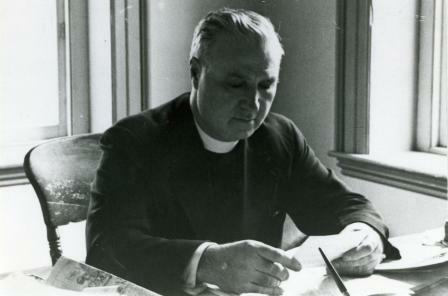 Although the Vatican had honoured him with the title of Monsignor in 1946—which he did not relish and believed could be detrimental to his work—he experienced health issues and witnessed a stall in the growth of the Antigonish Movement. By the late 1930s, Coady had contemplated helping people in underdeveloped nations. After World War II, increasing numbers of people interested in the co-op movement were coming to St.F.X. They were mostly Catholic clergy and leaders from third world countries in Latin America and Southeast Asia. The high profile of the Antigonish Movement and the renewed interest from abroad attracted some attention from the American government that saw it as a promising means to combat communism in the Cold War era. A heart attack in February 1952 forced Coady’s resignation as Director of the Extension Department. Unwilling to totally relinquish his important work and characteristic work horse tendencies he remained active in his retirement years writing many letters, giving numerous speeches and conceiving new community development strategies. Accolades poured in from around the world, testifying to how Coady had affected many lives personally and had made the world a better place. Dr. Coady died on July 28, 1959 and was carried to his grave at St. Ninian’s Parish Cemetery overlooking St.F.X. University by two farmers, two fishermen, a miner and a steelworker. Shortly after his death, and named to honour and commemorate his work, St.F.X. established the Coady International Institute to train people from around the world in the techniques and principles of the Antigonish Movement. Unfortunately he never saw his dream become reality.